Printing is at an extraordinary crossroads: never have people taken more photos (most of us have 1000+ photos on our cell phones alone), but also never have they printed less. Faced with this potentially far-reaching dilemma, Epson knew they needed a campaign that elevated their brand beyond just hardware, technology and inks. 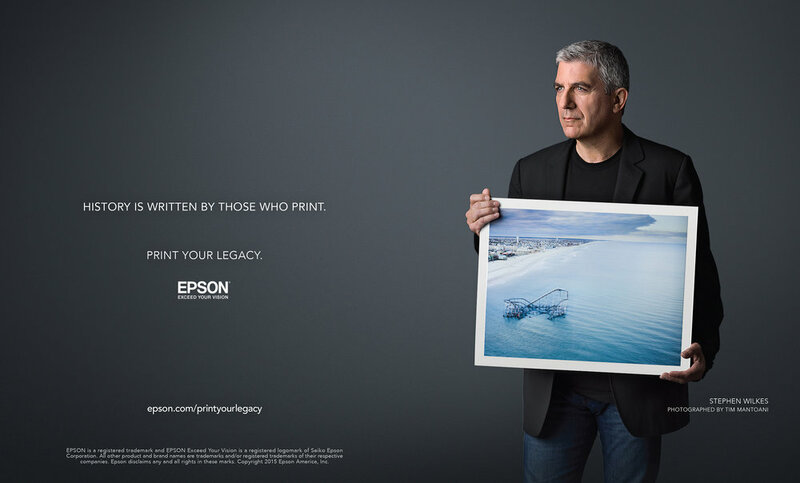 In a world where more and more emphasis was being placed on virtual media, Epson needed to remind everyone about the power of the print. And so, the Print Your Legacy campaign was born. We asked the world's most renowned photographers to tell us why they print. Then we went directly to where photography thrives in the social space - Instagram - to invite today's generation of photographers to discover the power of printing your legacy. MARK SELIGER is known for his iconic celebrity portraiture. Every year, he shoots the Vanity Fair Oscar issue. AMY TOENSING's image of the drought-stricken Australian Outback was chosen by National Geographic as one its 50 Best Photos. STEPHEN WILKES' image of the Jet Star Rollercoaster helped bring home the magnitude of Hurricane Sandy's devastation of the eastern seaboard. We launched the campaign with a long-form video that featured all ten of our photographers sharing their thoughts on photography and printing. Then we edited the most interesting soundbites from each photographer into short 15-second clips tailored to Instagram's video format. We also invited the photographers to take over the Epson Instagram account for a week, during which they could curate content, post their images and field questions from Epson followers. Finally, we surprised a handful of Instagram's most talented photographers by mailing them a small collection of their images, printed on Epson paper by Epson Pro Series printers. We put their printed images directly into their hands, often for the very first time, so they could experience for themselves the power of the print.